It is highly frustrating when a book that screams potential fails to live up to it. Not a Drop to Drink could have been something bold and off-beat but alas, McGinnis just had to squeeze in unnecessary cliches and kill the originality. 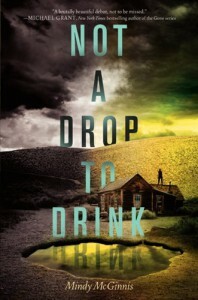 Not a Drop to Drink describes an apocalypse that is chilling in its plausibility - no drinking water. In Lynn's world, having a pond in your backyard is akin to having an unlocked safe that everyone knows about and wants a share of. Survival does not come with a list of alternatives. Either kill to defend what you have or die trying. If you have nothing, take what you can by force or die from a parched throat. It's a hard life in a bleak world for Lynn, and the only person she shares it with is her mother. Hardened by circumstance, these women spend hours on the roof scoping the horizon for strangers and shoot without hesitation whenever someone gets too close. They do their own hunting, grow their own vegetables, chop their own firewood, drink from their own pond. This is roughly the first 20% of the book and it's awesome. The prose is spare and complements the desolate landscape beautifully. But once mother dies, the book goes on a nosedive and never recovers. My biggest beef is Lynn herself. Her actions are so contradictory to her supposed upbringing that I don't see her as a real person at all. 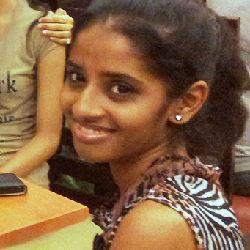 This is a girl who has never interacted with any human being besides her mother. The only man she has known all her life is the cripple who lives in the neighborhood, but they have never actually spoken. She has been taught to think of all strangers as enemies, trained to kill without remorse. Any girl who lives like this for sixteen long years will, in my opinion, have zero social skills. And if she suddenly finds herself orphaned, she will only become tougher. More distrustful of people around her. Scared. Confused. Lynn, on the contrary, develops amazing social skills and goes all soft. Barely a fortnight after her mother's death, she's chatting with the neighborhood cripple, looking after a young girl that a stranger, I repeat, a stranger, entrusted to her care, and falling in love with the stranger, I repeat, the stranger, himself. How completely out-of-character is this?? I don't have a problem with tough girls going soft. Actually, I want Lynn to have a conscience, I want her to think before she pulls the trigger. But this must happen gradually. In degrees. Convincingly. Not overnight. Not so suddenly. And no way can such a girl be so comfortable in a relationship. That idea is too far-fetched. Lynn, who did not know what flirting meant till Eli told her, is now cuddling up with him in bed?! I understand if she has feelings and she's confused and doesn't know what to do, but I do not buy that she would so readily act on her feelings. Another thing that bothered me was the overall lack of finesse. The prose is beautiful and descriptive but more often than not, it describes the wrong things. This is not a happy story. Some very tragic things happen. But Lynn's emotional reaction to these events is absent in the narrative. There are long passages about what Lynn saw, what she did, what she said, but nothing about what she felt or thought. This is where McGinnis could have shown Lynn's soft side - by letting her mourn, process her grief, come to terms with her loss. NOT BY letting her adopt an orphan or be in a relationship - things that go completely against Survival-101 that mother taught her. I was taken aback by the ending, but in a good way. It was unorthodox and brave - two adjectives that could have described the book had McGinnis not tried to make unwarranted additions to what should have been a spare, unadorned survival story. It is not a great feeling to go from "This is surprisingly good" to"Meh" in less than 100 pages. I read this book because the reviews convinced me this was not the usual dystopia, and while that is true, it is still not good enough.